A stunning example of traditional Japanese minimalism, the impeccable craftsmanship shown in our collection of Japanese wood and lacquer works is native to the Yamanaka region of Japan.Around the 18th century, craftsmen in Yamanaka Prefecture began to produce items for everyday use (soup bowls, trays, and souvenirs) for visitors to Yamanaka Spa, and the lacquerware industry grew along with the development of the region's natural hot springs. In this way, lacquerware entered the mainstream mindset of Japanese culture. The centuries-old manufacturing process is as delicate and detailed as the pieces themselves. From precise carving to meticulous lacquering, modern Japanese woodworking molds traditional methods into contemporary shapes. The results are elegant, amazingly lightweight pieces that are as functional as they are beautiful. The unique manufacturing process is responsible for both the beauty and the durability of its singular pieces. While most lacquerware uses horizontally trimmed wood, Yamanaka-styled lacquering involves carving the wood into thin slices vertically. Core pieces of cherry birch wood are naturally dried to remove moisture, then thinned and hand-carved on a wood-turning lathe. Then, the wood undergoes a lengthy lacquer process involving several rounds of lacquer being rubbed on, wiped off and dried. Following traditional techniques, every step in this process is then repeated five to ten times, then dried extensively, until after around a year the piece is completed. 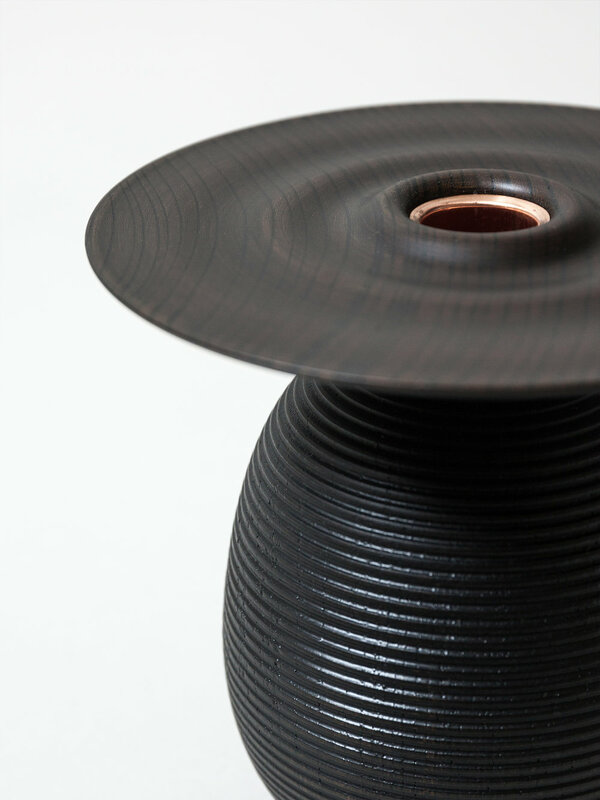 Though its craftsmanship has historic roots -Yamanaka lacquerware was designated a traditional Japanese craft in 1975- Japanese lacquerware continues to push the boundaries of modern design. The latest designs are hand-carved with perfectly spaced, finely engraved rings, forming geometrically perfect ridges that flow elegantly around its surface. Their design provides a layered experience for the senses: the beautiful visual harmony of its sculptural form, the subtle smell of fresh wood, and an incredible weightlessness. Its impeccable design, sculptural form, and weightlessness suggest both an innate strength and a graceful fragility.